PLUTO 13 IT'S BEEN PROVEN 19 If a tree is deciduous it sheds it's leaves in the fall-------------------------- 20 The nine men who contributed most to Spectroscopy and are considered the fathers of the spectroscope are: Hy. Draper, Kepler, Newton Wollaston, Fraunhofer, Doppler, John Draper, Kirchhoff, Huggins, and Edison------------------------- When at the Chicon, be sure to visit the Adler Planetarium, and the Yerkes Observatory of the University of Chicago, if at all possible. And also by all means, by all means enjoy yourself. If you pass through Williams Bay, Wisconsin, You can visit the Yerkes Observatory, for it is here that the University Of Chicago Observatory is located--Strange people these Chicagoans---very strange people------------------------- Q.E.D. 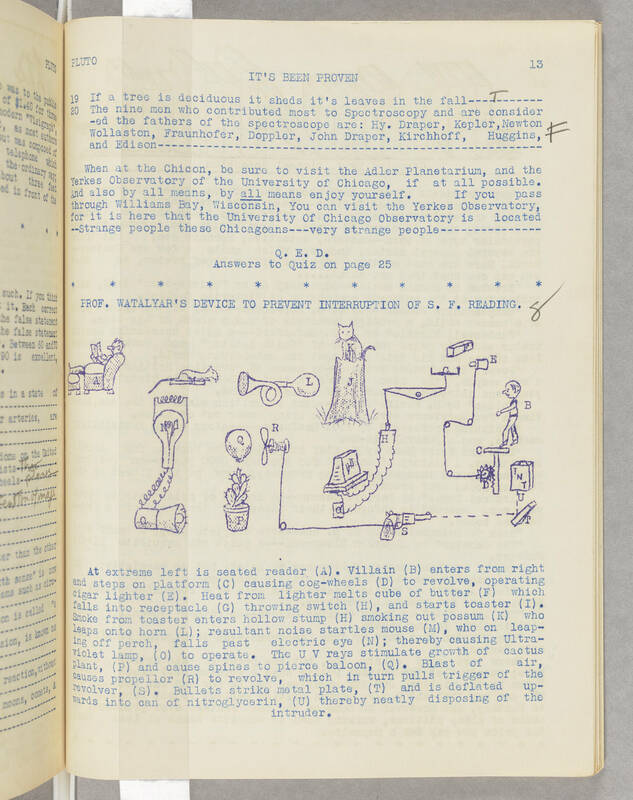 Answers to Quiz on page 25 * * * * * * * * * PROF. WATALYAR'S DEVICE TO PREVENT INTERRUPTION OF S.F. READING. [IMAGE] At extreme left is seated reader (A). Villain (B) enters from right and steps on platform (C) causing cog-wheels (D) to revolve, operating cigar lighter (E). Heat from lighter melts cube of butter (F) which falls into receptacle (G) throwing switch (H), and starts toaster (I). Smoke from toaster enters hollow stump (H) smoking out possum (K) who leaps onto horn (L); resultant noise startles mouse (M), who on leaping off perch, falls past electric eye (N); thereby causing Ultraviolet lamp, (O) to operate. The UV rays stimulate growth of cactus plant, (P) and cause spines to pierce baloon, (Q). blast of air, causes propellor (R) to revolve, which in turn pulls trigger of the revolver, (S). Bullets strike metal plate, (T) and is deflated upwards into can of nitroglycerin, (U) thereby nearly disposing of the intruder.